At the same time, Mr. Ford promised to end hallway medicine. These two sets of promises are contradictory. One clue to what’s planned came a few weeks ago when Mr. Ford appointed axeman Gordon Campbell to be his financial guru. Mr. Campbell is the former B.C. 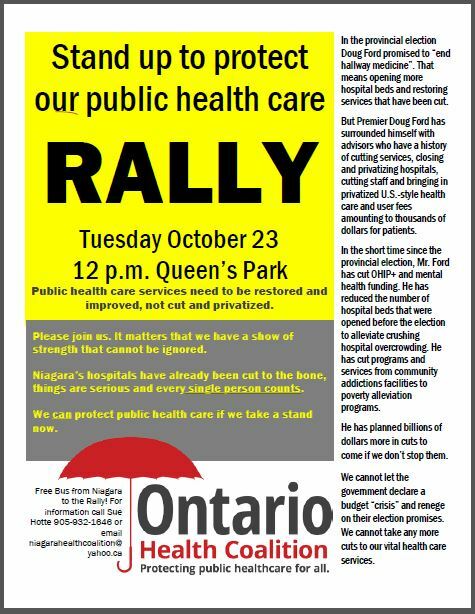 premier who cut and privatized hospitals and their services en masse. Under his leadership, user fees for patients ballooned to the worst in the country. As a result of his policies, B.C. is ground zero for health care privatization in Canada, two-tier medicare is rampant, long waits and poor access to care exist throughout the system and, appallingly, Mr. Campbell is helping the private clinics in their attempt to bring down public medicare laws in Canada through a court challenge. 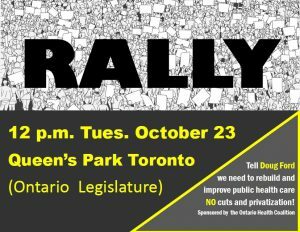 Mr. Ford has no mandate whatsoever to cut and privatize health care. But given the pro-private anti-public health care people he is surrounded with, we are deeply concerned that they will try to foment a fiscal crisis and use it to justify pushing through cuts and privatization that would devastate our public health care. We all know that we cannot take any more cuts. What we urgently need in our province is to reinvest, to rebuild our health care — not cuts and privatization. Sometimes the best defense is a good offense. The best way to protect public health care is to push for what we know we need and to ensure that this government is afraid to cut and privatize health care. We need to set the agenda and make them respond to us. Please join us. A show of strength is vitally important at this juncture. 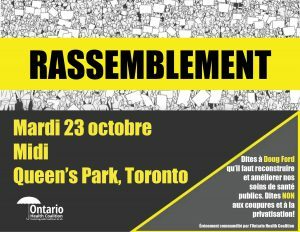 We know that the people of Ontario are with us. No one wants more cuts. The overwhelming majority of Ontarians oppose health care privatization. We need to mobilize, to make visible the public demand to improve our public health care. We need to inspire people to stand up and make cuts and privatization impossible. We can do this. We’ve done it before. But we need your help. Hospital funding must be set at a rate that will protect service levels and stop cuts. This means a 5.3%/year funding increase for the next four years. A capacity plan must be developed to plan to meet population need for care. Closed hospital wards and floors must be reopened, closed Operating Rooms must be funded, and services that have been cut must be restored. Closed and privatized outpatient services must be reopened and restored in our local public hospitals to meet population need, including but not limited to outpatient physiotherapy, labs, day clinics and others. Patients must be protected from extra-billing and user-fees in private clinics. Canada’s and Ontario’s Medicare laws must be protected, strengthened and upheld. An immediate moratorium must be declared to stop the closures of local hospitals, consolidation of local services and the mega-mergers of our local public hospitals. New hospitals must be financed using public borrowing rather than exorbitantly expensive P3 privatization, with sound management and public oversight. The substantial savings generated from this can be used to rebuild public capacity and improve access to care. Our public hospitals and health services must be governed democratically in the public interest by Board of Directors that reflect the diversity of our communities. Services must be transparent, accountable and responsive to patients and communities. Legislation must be amended to provide full access to quality of care information in public hospitals. Staff should be protected when they advocate for quality and access issues in the public interest. Concrete steps must be taken to move public funding away from activities that do not add value and are not improving care. Curtail exorbitant executive salaries and the use of PR firms, unnecessary advertising and consultants. Cease the practices of shadow-billing and price-based procedures in hospital clinical care.